- US senators John McCain and Christopher Murphy gave strong support to Macedonia’s NATO membership. According to McCain and Murphy, the series of NATO summits at which there was no enlargement seriously damaged the reputation of the Alliance. - Serbian Prime Minister Ivica Dacic arrived Sunday in Macedonia and had a meeting with Macedonian Prime Minister Nikola Gruevski. Dacic comes to Macedonia in a time when Serbia is preparing early elections and the Serbian public expects a stance of him in relation to the new elections. Dacic and Gruevski on Sunday attended the ceremonial academy on the occasion of the holiday “St. Sava” and their speeches delivered confirmed the good relations between the two countries and the possibilities open issues to be closed through dialogue. With 69 votes in favor, six against and no abstentions, the modifications to the election law passed Parliament Thursday. The modifications had previously been agreed upon by all political parties from both the government and the opposition. Only PDSH did not participate in the negotiations and they voted against the proposed modifications. They also accused BDI of having accepted anti-Albanian modifications. Under the modified election legislation, political parties will not be allowed to accept donations exceeding 50,000 euros, to begin construction of facilities and to put to use already put up facilities during election campaigns. Only the issue concerning the diaspora vote has remained unresolved. Parties have agreed to revisit it before the holding of the parliamentary elections. In the presidential election set to be held in April, for the first time voters will be marked with visible ink that cannot be washed off for 24 hours, and new members will be assigned to the electoral boards at the Macedonian diplomatic missions and consular posts. If you promote principles in Macedonia, then you should promote the same principles in all member states and candidate member states of the EU. We are going to be the first to support you because we believe in a successful European project, Macedonian Foreign Minister Nikola Poposki told Richard Howitt, the Rapporteur on Macedonia at the European Parliament, at their meeting in Brussels Wednesday, at which the main subject was the EP’s draft resolution on Macedonia’s progress in 2013. According to the press release from the Macedonian Ministry of Foreign Affairs, Minister Poposki thanked Howitt for the European Parliament’s continued support for Macedonia’s EU integration. He also added that every Member of the European Parliament has the responsibility to promote European principles and that the breach of the European principles taints the credibility of the EU in the eyes of the Macedonian citizens. “It is therefore important that the assessments and values voiced by the Members of the European parliament are on the same line with those that the EU promotes on its territory. An attitude toward a certain candidate member state different from the attitude toward the member states may harm the credibility of enlargement. The effect of the forthcoming European elections on the activities of a few sitting MEPs is evident. We share their concern over the status and ambitions of the most radical movements in Europe, all of which should be an additional motive for us to act reasonably as a European-oriented stakeholder,” Minister Poposki said. - Deputy PM for European Affairs Fatmir Besimi and Macedonian Foreign Minister Nikola Poposki on Wednesday met with European Commissioner Stefan Fule and Director General for Enlargement Christian Danielsson. Ahead of the meeting with Fule and Danielsson, Poposki met Wednesday with rapporteur Richard Howitt and discussed about the main issues that could be a subject of the accession dialogue. With 48 votes in favor, four against and six abstentions, the Committee on Foreign Affairs of the European Parliament adopted Tuesday the resolution on the Republic of Macedonia drafted based on the European Commission’s latest progress report. According to MIA’s Brussels-based correspondent, only two changes occurred Tuesday to the latest compromise amendments that Rapporteur Richard Howitt submitted—the “bilingualism” that Howitt called for has been replaced with “bilingual education on a voluntary basis” and an explanation has been inserted clarifying that the mentioned ultra-nationalism pertains to all countries involved in the enlargement process and not exclusively to Macedonia. The number of Macedonian citizens who believe that the name of the country should not change in any way is rising. At the Thursday debate organized by the Macedonian Center for International Cooperation and the Societas Civilis Institute of Democracy at which the results of their public opinion poll related to the name issue with Greece were presented, Macedonian politicians and analysts pinpointed the rigid Greek position as the reason for this, Nova Makedonija reports. Construction of facilities, putting into operation facilities built with budget money and an imprisonment sentence of six to 12 months for those who break this rule are only some of the provisions that the government and the opposition agreed upon and that will be incorporated in the new election legislation which is going to pass Parliament with consensus, Nova Makedonija reports. All political parties have welcomed the agreement and believe the modifications are going to improve democracy and political dialogue in the country. SDSM hope that no interventions will have to be made through amendments. According to Cvetanka Ivanova from SDSM, the presidential poll will be the crucial evidence whether the government is committed to fair and democratic elections in reality rather than just on paper. “As a political party, we welcome the decision that the modifications to the election legislation should include the recommendations from the OSCE/ODIHR. A key test to the practical realization of the agreement will be the presidential elections this year where the government is going to demonstrate whether it truly wants to organize free, fair and democratic elections,” Ivanova said. - Prime Minister Nikola Gruevski announced that the Government made a decision to solve the status of 3,000 redundant workers from state firms and 4,000 professional soldiers. According to PM Gruevski, the ministries of defense, justice and interior in ten days must draft the analysis on employment of professional soldiers in state institutions and the redundant workers from state firms who will receive at least 7,100 denars per month. Necessary 4 million euro will be covered by the state budget. VMRO-DPMNE is going to bring into question the governing coalition if it insists that President Gjorge Ivanov should be reelected for another term. BDI made it clear that they would not support Ivanov because in his present term he failed to show he was the president of all citizens. As a way of avoiding divisions and a crisis in the governing coalition, Ahmeti offered his coalition partner that they should nominate a consensual candidate, Vest reports. MP Ermira Mehmeti from BDI says that BDI wants the governing coalition to remain stable yet if VMRO-DPMNE nominates Ivanov for another presidential term despite knowing what BDI think of his nomination, the stability of the coalition will inevitably be upset. “This is going to be a test to the governing coalition. We believe that in our cooperation with VMRO-DPMNE so far we have built mutual trust to be able to overcome these differences. Moreover, the policy of obstinacy leads nowhere,” she said. The news that Muhamet Halili intends to renew the first political party of Albanians in Macedonia—the Party for Democratic Prosperity (PPD) that disappeared from the Macedonian political arena two years ago—has prompted diverse reactions from relevant political parties as well as from political analysts. Halili, former vice president of the party, an MP and an ambassador, said efforts were made to hold the inaugural meeting of the party by the end of January, Dnevnik reports. “Together with some Albanian intellectuals we are making much effort to recreate this party. Our goal is to reinstate the right policy for Albanians in Macedonia. We are ready for new elections,” Halili said. Fatmir Besimi, Deputy Prime Minister for European Affairs, had a USAID-paid breakfast with journalist on Thursday at which he presented Macedonia’s EU agenda 2014. With reforms at home and with openness for dialogue with neighbors Macedonia is going to act during the six-month Greek Presidency of the EU that started on Wednesday. Asked what Macedonia would do during the Greek Presidency, Minister Besimi said that first he was going to write a letter to Greek Foreign Minister Evangelos Venizelos to wish him a happy new year and successful presidency. He said that it was during the previous Greek Presidency that the Thessaloniki Agenda for the Western Balkans was passed and added that Macedonia would retain its constructive approach and positive spirit in resolving problems with Greece and Bulgaria and would continue conducting reforms because, he said, they were Macedonia’s biggest argument. - Prime Minister Nikola Gruevski in his New Year’s message to Macedonian citizens summed the work of the Government and once again boasted with projects which were realized and announced the new projects for 2014. According to Gruevski, there will be an increase of the salaries of administrative workers in 2014 and he boasted with the employments of the socially-endangered categories. In the course of his nearly two hours long New Year’s interview with the Macedonian Radio and Television (MRT), Prime Minister Nikola Gruevski did not resolve the dilemma whether early parliamentary elections would be held at the same time with the presidential poll next year. “There is no situation that would make me want early parliamentary elections. At the moment we are not focused on that. However, if atmosphere is created in which our projects and policies are put at risk or if someone insists on them, we are ready for elections. I neither confirm nor reject that possibility,” Gruevski said in the interview most of which he used to praise the government policies. President Gjorge Ivanov’s initiative for effectuation of the Judgment of the International Court of Justice in The Hague via the UN Security Council mirrors the factual situation on the ground, said Foreign Minister Nikola Poposki. 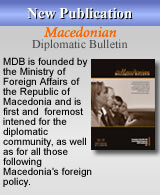 However, he refused to reveal any other details of Macedonia’s future steps in this regard. “It is fact that all criteria have been met for this to happen. At the moment, we would not like to speculate whether and how this could happen,” he said. - The economic diplomacy will be the second most important sphere at which the Macedonian ambassadors should focus on in the upcoming year. At this year’s working meeting in the Ministry of Foreign Affairs, the ambassadors will have the task to attract investors and they will develop “health diplomacy” too. Macedonian Foreign Minister Nikola Poposki reiterated that the EU and NATO integration and the relations with the neighbors will be the main priorities next year too and the reforms must resume until then. - In his last annual parliamentary address in his present term of office that he delivered in the absence of the MPs from BDI, PDSH and RDK, who insist that the next head of state should be consensual, Macedonian President Gjorge Ivanov said that conditions have been created for Macedonia to ask of the UN Security Council to effectuate the Judgment of the International Court of Justice in The Hague. President Ivanov said that Macedonia’s international position strengthened, that the number of partners and supporters in the EU and NATO and the number of countries that have recognized Macedonia increased. He also highlighted as positive the EU progress report on Macedonia and Macedonia’s participation in the South Stream gas pipeline project. The opposition denounced him for not providing answers to crucial questions, such as crime and corruption, partisan judiciary, pressure on media and divisions along all lines. - The conclusion of the ministerial council of the European Union is a sophisticated version of the veto from NATO in Bucharest in 2008, said Macedonian Prime Minister Nikola Gruevski following the December summit of the European Council in 2009 when the first EC recommendation for opening accession negotiations with Macedonia was discussed. The opinions whether the block from the EU and NATO are of the same format were divided at the time, but from the present point of view, it appears that there is no dilemma. The ministers of foreign affairs of the EU member states are going to adopt Tuesday at the meeting of the General Affairs Committee (GAC) the conclusion on the Republic of Macedonia to be passed at the Summit of the European Council on Thursday and Friday by the heads of state and government of the EU member states. - The Parliament is to launch Monday the debate on the 2014 draft-budget. According to announcements, next year the budget will total 2.8 billion euro and 20 percent more funds are envisaged for capital investments. During the amendment debate, only 2 amendments were accepted from a total of 684 amendments. - Macedonian Foreign Minister Nikola Poposki on Friday in Sofia is to hold a meeting with Bulgarian counterpart Kristian Vigenin and they are to analyze the reports of the Macedonian and Bulgarian negotiation group on the agreement on good-neighborliness. Other details about the meeting have not been revealed and it is added that Poposki will also meet with members of the group of friendship between the two countries. - Parliament Speaker Trajko Veljanoski is to pay an official visit to Tirana on Thursday where he is to meet with Albanian counterpart Ilir Meta and with Albanian President Bujar Nishani and Prime Minister Edi Rama. 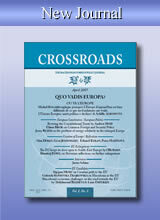 Macedonia’s European integration is the main national priority and strategic goal of the country. We are dedicated to the EU agenda. However, we are continuously being told that Macedonia cannot begin membership negotiations because the EU wants to have a clean file and keep peace at home. The Union should no longer wait to launch accession talks with us because opening negotiations will be a catalyst for the resolution of the name issue, said Macedonian Prime Minister Nikola Gruevski in his speech delivered at the European office of the Konrad Adenauer Foundation in Brussels before representatives of the European Union, ambassadors, diplomats, and journalists of world media. He underlined on that occasion that the rule of law was a fundamental value of the EU and that all member states should act in accordance with international law and the undertaken legal responsibilities. “The International Court of Justice decided that the Greek block of Macedonia’s NATO integration was illegal and in breach of the bilateral agreement signed in 1995. This decision clearly justifies our position and our right to use the constitutional name of our country and to join international organizations such as the EU and NATO under the provisional reference. Greece did not act in keeping with the judgment of the Court in The Hague and therefore we wonder what the role of international law is,” the prime minister said. Within the framework of the diplomatic campaign in the run-up to the summit of the European Council later this month, Prime Minister Nikola Gruevski had a meeting in Brussels Monday with European Council President Herman Van Rompuy whom he informed in great detail about the situation in Macedonia and the Macedonian arguments for the anticipated progress. Prime Minister Gruevski explained all important things related to Macedonia in order to help Mr. Van Rompuy realize what is really happening in the country. At the same time, he expressed hope that a way would soon be found to overcome the remaining obstacle keeping Macedonia from opening accession negotiations. “We arranged the meeting with the President of the European Council about 10-15 days ago and it was at our request. We wished to present our arguments in relation to our progress that we expect in the future. We talked about the reforms we are carrying out, what we have achieved thus far, the problems we have faced in the past and how we resolved them. We discussed the problems we are currently facing as well. We focused on the numerous reforms we have conducted in the economy, the justice system and the administration, and particularly the latest law we have drafted in this area,” Prime Minister Gruevski said. Macedonia has to change its attitude to the Balkans. The Balkans is not a problem but an opportunity for Europe. Macedonia plays a key role for stability and if we want stability in the Balkans, Macedonia has to become a member state of NATO and the EU,” said Hungarian Prime Minister Victor Orban at the press conference in Skopje Thursday that he held together with his host, Macedonian Prime Minister Nikola Gruevski. “In recent years, Europe has lost a lot of its credibility and therefore has to find a way to restore its influence in the world, which can best be done with the Balkans,” Prime Minister Orban said. Prime Minister Gruevski emphasized that Hungary was an honest friend to Macedonia, that Macedonia had excellent political and primarily friendly relations with Hungary and that the Hungarian Prime Minister’s visit to Skopje Thursday was one more confirmation of that. “We have received confirmation from Prime Minister Orban on this occasion, too, that Hungary’s support for Macedonia’s European integration and opening accession talks as soon as possible is going to continue at the same intensity,” he said. The world superpowers should put pressure on Athens to make it honor the Judgment of the International Court of Justice in The Hague so Macedonia can join NATO under the provisional reference. This is in brief the strategy of the Macedonian government for removing the Greek block that has kept the country from NATO integration for too long. This strategy can be discerned in the recent statements of the Macedonian state officials and in the reports of the Greek media, Nova Makedonija comments on its front page. The Greek paper To Vima reported Wednesday that Macedonia had also sent a non-paper to NATO resurrecting its request that the country should be allowed to join the Alliance under its provisional reference. Foreign diplomats raised this issue in Skopje last week, while Macedonian diplomatic sources say that Macedonia sends such appeals before every major summit of the Alliance at the time its agenda is defined. In those non-papers the country calls attention to the fact that it has met all NATO membership criteria, that it is an active contributor to NATO’s peacekeeping missions and that at the Summit in Bucharest Macedonia was denied an invitation because of the Greek objection motivated solely by the unresolved name issue. - President Gjorge Ivanov on Thursday is to present Hungarian Prime Minister Victor Orban with the “8 September”. Order Orban, who is paying an official visit to Macedonia, will receive the award for his merits in the cooperation between Macedonia and Hungary. - President Gjorge Ivanov paid Tuesday a working visit to Austria where he met with Austrian counterpart Heinz Fischer. Fischer clearly stressed that Austria will give green light for Macedonia’s integration because time has come for start of the EU negotiations. - Macedonian Foreign Minister Nikola Poposki on Tuesday and Wednesday is to participate in the Conference on the Euro-perspectives of Western Balkan, held in Brussels, and is to deliver a speech at the Conference entitled “Return of the Economic Recovery”. During his visit to Brussels, Minister Poposki is to participate in the traditional European Prayer Breakfast at the European Parliament and is to meet with many European politicians. After a one-year delay, the new law on criminal proceedings, which significantly changes the role of public prosecutors, enters into effect on Monday (2 December). The Prosecution will hereafter be the key factor in conducting investigations, which spells the end of the era of investigative judges. These massive changes are put down to the need of making the law enforcement authorities more efficient and more mobile in resolving crimes and tracking down criminals. Although the four investigation centers and the justice police foreseen in the law have not yet been formed, the Prosecution says it is ready to take on the new responsibilities. As for the investigations that are in progress, additional talks will be held with the Supreme Court in order to ensure the cases run by the previous and by the new law do not get mixed up. For this matter, too, the Prosecution says, solutions have been devised in the transitional and closing provisions of the new law.